E.E. Giorgi is a scientist and an award-winning writer and photographer. She spends her days analyzing genetic data, her evenings chasing sunsets, and her nights pretending she's somebody else. On her blog, E.E. discusses science for the inquiring mind, especially the kind that sparks fantastic premises and engaging stories. 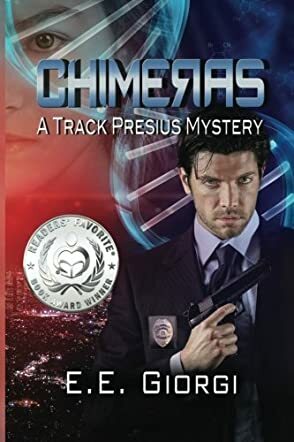 Her detective thriller CHIMERAS, a hard-boiled police procedural with a genetic twist, is a Readers Favorite International Book Award Winner, and Arizona-New Mexico Book Award finalist and a B.R.A.G. Medallion Honoree. After yet another shooting while on duty, Track is under the microscope again. This time it’s knocked him down from his dream job of robbery and homicide detective to investigating a missing person’s case. Huxley is a girl with a lot to stick around for, but when she simply vanishes without a trace (only to have her car turn up at a murder scene) there’s definitely something going on. Fortunately for Track, that means his missing person’s case just got a whole lot more interesting and he’s determined to find out what happened to her. Chimeras by E.E. Giorgi is a story of more than just adventure because Track has other secrets in his past, secrets even he doesn’t fully know. Track is an interesting guy. He’s funny, he’s friendly (to most people, anyway) and he’s in love with his job. He’s also determined to do a good job every time he takes a case, even when it’s not a case he wants. This book drew me in immediately because that’s how fast the action and adventure begins … immediately. Your heart will be pumping a mile a minute as you read this book and you’ll be amazed at every turn of the page. The adventure doesn’t stop and the characters just keep getting better and better. Chimeras will show you there’s more to police work than meets the eye and no case is truly ‘simple’ after all. E.E. Giorgi definitely has a star with this one. I can’t wait to read more about Track.